Tony's Kansas City: Amid Worsening Drought: Is It Time To Reconsider The Great Kansas Aqueduct?!?! Amid Worsening Drought: Is It Time To Reconsider The Great Kansas Aqueduct?!?! Like all blogs, we love amateur urban planning and ideas that shake up the status quo. 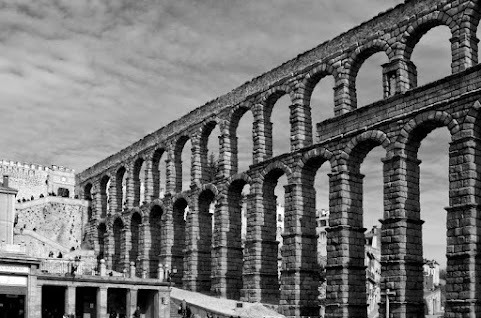 Btw, that's an old Roman aqueduct in the lead photo, it's still standing so it also serves to provide proof of concept. Genius perspective worthy of consideration . . .
Read the post in its entirety. Great idea. Will President Trump give us a few billion dollars for it? Not after that midterm vote methinks. Better idea - use Eminent Domain to depopulate Western Kansas and let it revert to grasslands. Even better idea - move the Missouri State Border 27 miles west and the Colorado Border 390 miles east, and the problem Kansas is having goes away immediately. It has been known for decades that the aquifer was being drained faster than replenishment could handle. I don't think wasteful usage should be "rewarded." Problem with an open aquifer is the water losses due to evaporation would make the problem nearly a zero sum gain. Pumping in pipelines would solve that issue, but could not generate enough to meet consumption rates. Not to mention, it would be incredibly expensive. There are ZERO good solutions for this other than going back to dry-farming which would reduce yields by half or more. Take away ethanol mandates and subsidies and quit growing water-intensive crops (corn) and take the hit on wheat yield, which will grow in dry-cycles.